Hi friends, after a short break I am back again with an easy and quick healthy wheat cake recipe. With Dates and Carrots as ingredients, I believe this will be an absolutely delicious cake recipe. Sieve wheat flour and baking powder thrice and keep it aside. In a large bowl, add in powdered sugar and oil. Beat it until creamy. Add each eggs one by one and beat. Add half of fresh cream and mix thoroughly. Add the wheat flour bit by bit and mix without lumps. Check the consistency of the batter and add rest of the fresh cream. Keep aside for a while. In a large plate mix chopped dates and plain flour well until the dates get a nice coating. Sieve it once to avoid the excess flour and mix in the batter along with grated carrot. Grease a large baking tin, and transfer the batter to it. Bake for 40 minutes or until the cake passes a skewer test. After baking, let it cool completely. Invert the cake to another board. Hope you all will try it and leave your comments below. 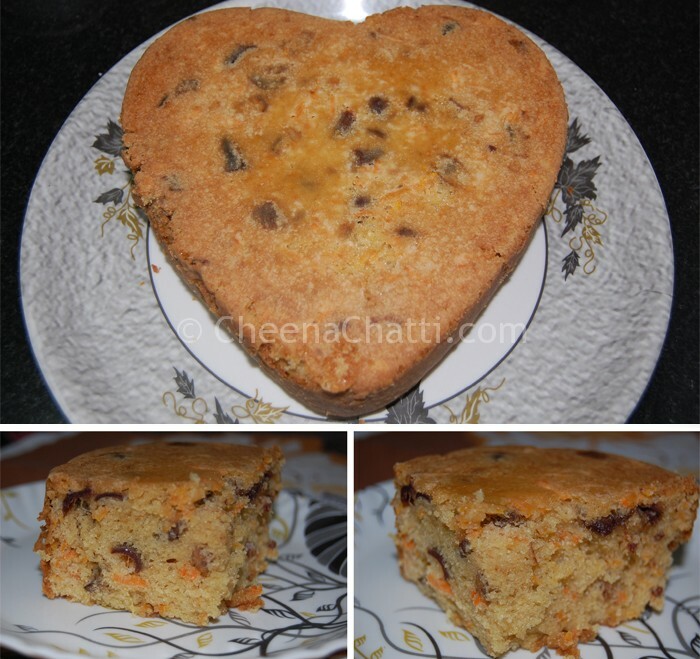 This entry was added on October 26th, 2013 by Athira Sooraj in Bakery and tagged with whole wheat cake recipe indian, whole wheat cake recipe, cakes, easy cake recipe, puffed wheat cake recipe, wheat, carrot cake recipe, wheat cake, cake recipes. Last revised on March 29th, 2018.
very nice recipe..thanks for sharing !